Last month’s 44 Blog Post Ideas for June was such a success that I thought I’d do it again! 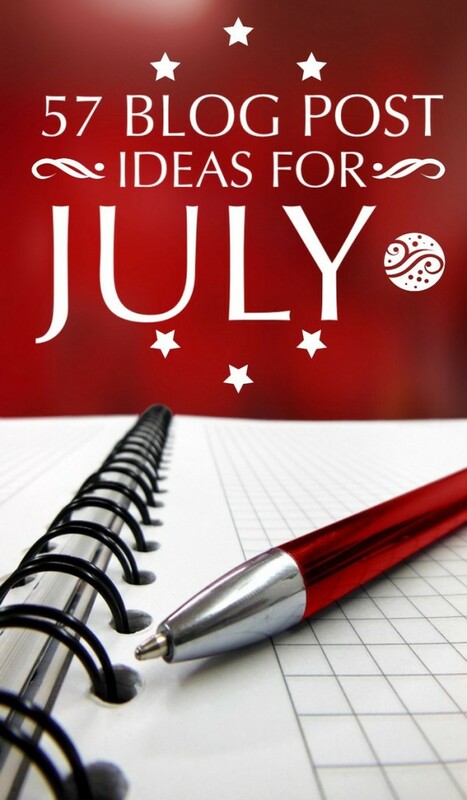 This time, I have writing topics and blog post ideas for July to help you brainstorm your way through the hot, muggy month. I don’t know about you, but I have a really hard time thinking when it’s so hot out! As with last month, these are all ideas that I either didn’t have room for on my own calendar or are so broad that we can all write about it without duplicating ideas (or both). Without further ado, I present 57 blog post ideas for July! Once again, I am breaking this up by post ideas that work all month and writing topics that, while COULD work any time, are perfect for specific holidays. Also, once again, thank you to Brownielocks, my go-to source for all the best “holiday” info. Top 10 Coolest Fanzines Ever (International Zine Month): Fun Fact, I had several fanzines over the years. I almost got kicked out of school for one called “Alice” back in the 90s. My most “famous” one, though, was Dilapidated Zine. I got to interview tons of awesome punk bands through that one. I also volunteered for A Reader’s Guide to the Underground Press (Zine World) for a few years, reviewing zines. An Open Letter to Parents Going Through Divorce (National Child-Centered Divorce Month)- Offer your own tips, things you wish you could say when you see divorced parents acting like jerks, etc. I have a few choice words I’d LOVE to say to someone (not my ex, we are amiable), but alas, it would just makes things harder for the kids in the middle. Blueberry recipes for National Blueberry Month. I did a roundup of 20 Amazing Blueberry Recipes two years ago, I’ll be doing something this year, not sure what yet. Grilled recipes, like amazing burgers, desserts on the grill, etc. Ice-cream recipes (think outside the bowl, like ice-cream sandwiches, fried ice-cream, or amazing topping ideas. Hot dogs beyond the bun, fun ways to dress up your hot dog (Hot Dog Month). I’ll be doing one this month! DIY “Fireworks” crafts (fireworks in a bottle, with straws, etc)- Check out this Glow in the Dark Straw Fireworks craft I made for My Kids Guide last year! My Homebirth Story (National Unassisted Homebirth Week)- if you have one, obviously! Kiss & Tell: All About My First Kiss! (World Kiss Day, 6th) – If you are married or with someone, obviously you should consider making it about your first kiss with them! A whole lot of stuff happens on the 11th! My Favorite Slurpee Memory (Slurpee Day and 7/11’s Birthday, on, of course, 7/11)- Share a story of a memory you made over Slurpees, a good time you had that involved 7/11, or even a favorite Slurpee recipe. My 7/11 memory involves a blizzard, and it’s how I learned to make my storm of the century mac & cheese! Your thoughts on the state of the world’s population (World Population Day, 11th)- this can get a bit controversial! 10 Reasons Why Being a Geek Is Spectacular! (Embrace Your Geekness Day, 13th)- Or 10 Reasons I’m Proud to Be a Geek! Comic-Con highlight on one or more of the scheduled events (check the Comic Con schedule here). Pick something that appeals to you and write about what you love about the characters, the idea behind the panel, etc. X Reasons Why Snakes Make Great Pets (World Snake Day, 16th)- Check out my post, What I Learned about Reptile Care By Snuggling a Python! Share you own dog’s rescue story! Share your favorite video games in your family, a story about a video game you loved as a kid or a game review for a new one you just got for Video Games Day on the 25th. Jacob and I LOVE Skylanders Trap Team! Awesome stuff here! Really interested in the awesome recipes and the craft ideas! These are going to be fun posts. Great Ideas! I didn’t realize all the food holidays and events in July. Thanks for sharing!